Auto back wash Self Cleaning Filter is used for Preliminary Filtration of demanding application of Various Industries. Its very useful for applications where suspended solid load is Comparatively high & highly viscous material and slurry based filtration applications. Auto Back wash type self cleaning filters work on a flow direction of outside to inside. Unfiltered fluid enters into filter housing through bottom tangential inlet connection. Contaminants are deposited on the outer surface of filter elements and clean filtrate passes through inside diameter of element and removed through the top tangential outlet. Users can set their differential pressure data within control panel. Once the differential pressure across the system reaches the pre-defined level of pressure drop, inlet and outlet valves shut down and the drain and backwash valves open for defined interval of time. During this process, debris deposited on outer surface of element shall be drained out and collected through bottom drain. 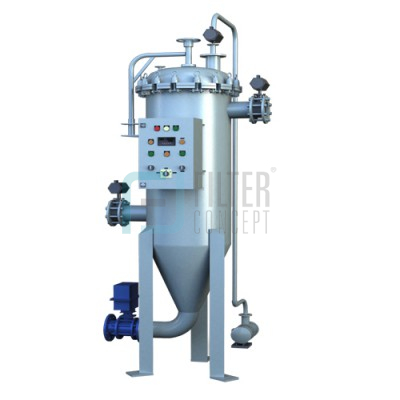 This cycle continues as per pre-defined settings and process requirements.Auto Back wash type systems are available with multiple filter elements, wherein one element is in use and the other can be cleaned at the same time. This will help to have uninterrupted flow of the fluid. Auto Back wash type self-cleaning filter is constructed of filter housings, filter elements, drain valve, auto back wash valve and PLC controller. Filter housings can be offered in various materials of construction such as various grades of stainless steel, carbon steel and alloy metal. Filter elements can be offered with wedge wire, sintered multi-layer wire mesh, plain wire mesh and sintered metal powder configuration. They are selected based on the requirement of filtration quality. For 100 microns and more, normally it is recommended to use wedge wire element. From 2 microns to 100 microns, it is advisable to use sintered multi-layer wire mesh and plain wire mesh, depending upon the application requirement. For final filtration of 0.2 microns to 5 microns, sintered metal powder is a suitable filter media. Customers can use pneumatically or electrically operated butterfly valve or ball valve as per their process requirement. Normally our systems are equipped with pneumatically operated solenoid valves for back washing and draining. Control panels can be offered with FLP (flame proof) and non-FLP, depending upon the process requirement. High filtration accuracy, stable filtrate quality and supply. Due to its own search and emergency operation function, self cleaning filter can do automatic back-washing and can cope with volatile fluctuations without manual intervention. 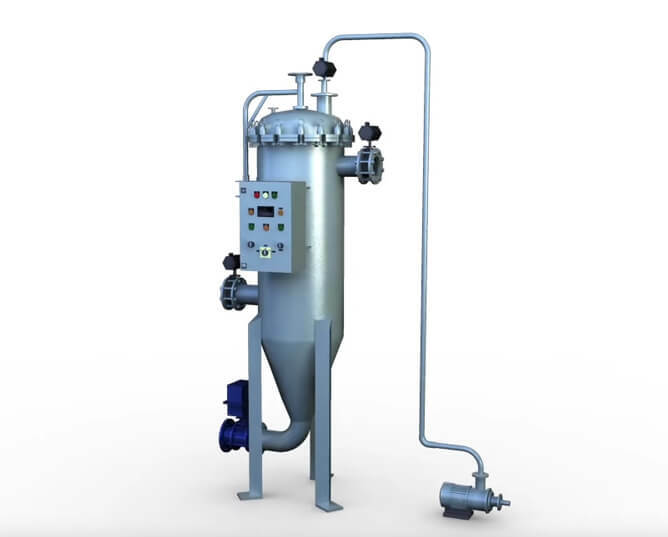 Filtration equipment control system is unique and has a precise operation, which is to adjust back-washing pressure setting according to different sources and filtration accuracy in a flexible way. The system has high efficiency and strong recovery. Its cartridge can be used for longer period without replacement. During the back-washing process, each cartridge operates in turn and meanwhile the other cartridges continue the filtration process without being affected. Self cleaning filter has a drain valve, which has a short-back-washing facility and consumes less water, thereby saving water, power and energy source. Reasonable and compact structural design. No consumable material, low operation and maintenance cost, simple operation and management.